This recent image of Titan reveals more complex patterns of bright and dark regions on the surface, including a small, dark, circular feature, completely surrounded by brighter material. During the two most recent flybys of Titan, on March 31 and April 16, 2005, Cassini captured a number of images of the hemisphere of Titan that faces Saturn. 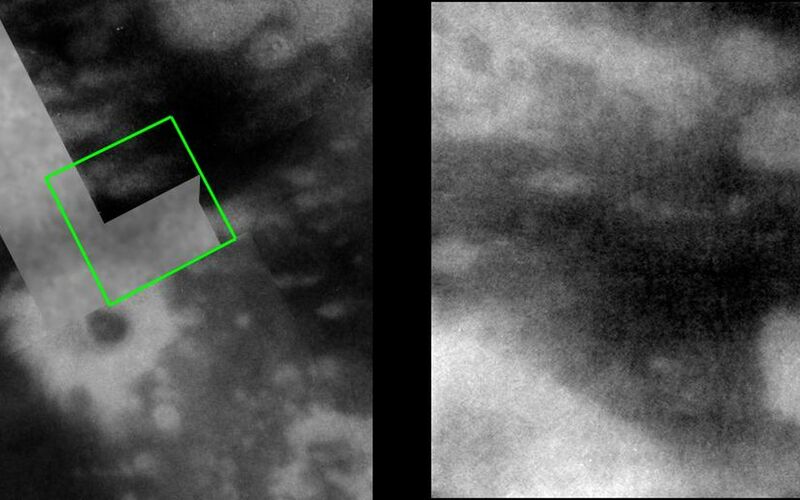 The image at the left is taken from a mosaic of images obtained in March 2005 (see PIA06222) and shows the location of the more recently acquired image at the right. 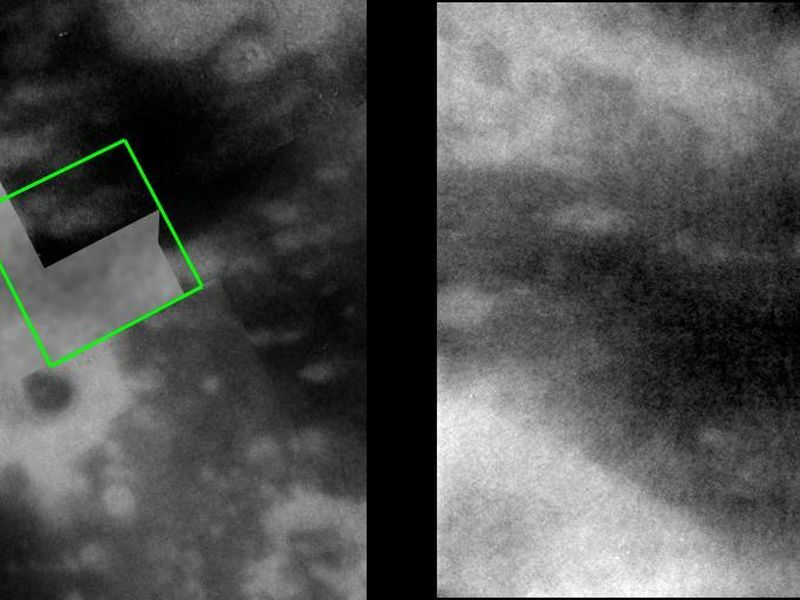 The new image shows intriguing details in the bright and dark patterns near an 80-kilometer-wide (50-mile) crater seen first by Cassini's synthetic aperture radar experiment during a Titan flyby in February 2005 (see PIA07368) and subsequently seen by the imaging science subsystem cameras as a dark spot (center of the image at the left). Interestingly, a smaller, roughly 20-kilometer-wide (12-mile), dark and circular feature can be seen within an irregularly-shaped, brighter ring, and is similar to the larger dark spot associated with the radar crater. However, the imaging cameras see only brightness variations, and without topographic information, the identity of this feature as an impact crater cannot be conclusively determined from this image. 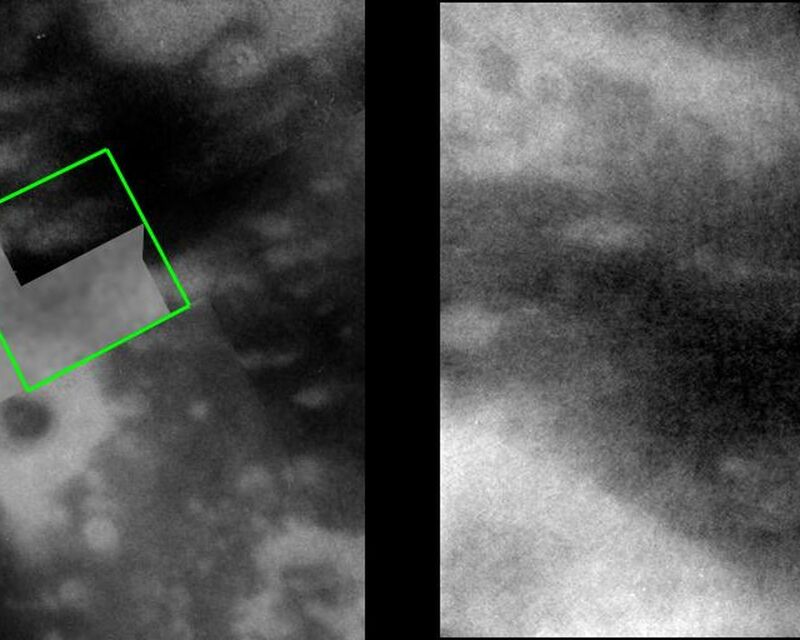 The visual infrared mapping spectrometer, which is sensitive to longer wavelengths where Titan's atmospheric haze is less obscuring -- observed this area simultaneously with the imaging cameras, so those data, and perhaps future observations by Cassini's radar, may help to answer the question of this feature's origin. The new image at the right consists of five images that have been added together and enhanced to bring out surface detail and to reduce noise, although some camera artifacts remain. These images were taken with the Cassini spacecraft narrow-angle camera using a filter sensitive to wavelengths of infrared light centered at 938 nanometers -- considered to be the imaging science subsystem's best spectral filter for observing the surface of Titan. This view was acquired from a distance of 33,000 kilometers (20,500 miles). The pixel scale of this image is 390 meters (0.2 miles) per pixel, although the actual resolution is likely to be several times larger.